Invasion Of The Mind-Controlling Zombie Parasites A few months back, something terrible happened to millions of flies around Washington, D.C. They were attacked by a fungus that basically made them zombies, unable to control their behavior. and flies are far from the only vulnerable creatures out there. 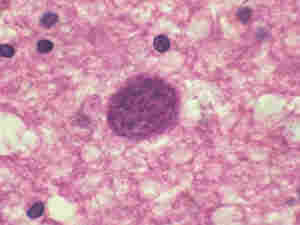 Toxoplasma gondii is a parasite, seen here in brain tissue, that can alter the behavior of the host. It can make rodents attracted to cats, leaving them vulnerable to getting eaten. A few months back, something terrible happened to millions of flies around Washington, D.C.
"We were getting literally hundreds of reports of these crazy dead flies everywhere — on vegetation, on sign posts," says Mike Raupp, an entomologist at the University of Maryland. He says the flies were attacked by a mind-controlling fungus. "It basically zombie-izes them. In other words, it manipulates their behavior," Raupp says. "[The fly] moves to a high point, let's say the tip of a blade of grass." The fly freezes at the tip of the leaf, and the fungus spews more mind-controlling spores into the wind. Mind-controlling parasites are all around us. The number of creatures that can be affected is "huge," says Janice Moore, a professor at Colorado State University who wrote a book on parasites and animal behavior. She says some parasites play with neurotransmitters; others with hormones. "If you take the world of parasites broadly, we don't know the half of it yet," she says. Parasites can be terrifyingly precise. One example that's becoming a little more understood is Toxoplasma gondii. "Toxoplasma basically makes rodents somewhat fearless around cats — in fact, it's even more than fearless," Moore says. "There's some evidence that they're attracted to the smell of cats and to cat urine." What happens to rats that like cats? They get eaten. On his laptop, Raupp plays a video from a lab in France. It shows giant worms exploding out of a dying cricket that's floating in a swimming pool. He says small organisms called hairworms begin to reach maturity inside the cricket. Then they make the cricket start to act erratically. "Crickets that would normally kind of move pretty slowly and stay in dimly lit areas actually become attracted to light," he says. "What this does apparently is bring them out of their normal habitat and increase the likelihood they're going to bump into a pond. Once they reach the edge of that water, they take the suicidal plunge into the water." That's when the hairworms leave the host and reproduce. Humans aren't necessarily immune to parasites' powers, either. "Studies have looked at accidents — individuals in automobile accidents, both actually drivers and pedestrians — and they have increased rates of Toxoplasma as well," says Bob Yolken, chair of Pediatric Neurovirology at Johns Hopkins medical school. The link is nowhere near conclusive, but still, Moore says it's enough to make you think. "I do think about free will some because I do think about how we're all trapped in our own skins," she says, "and to tell you the truth, free will in general, it always amazes me how in the same situation some people will rise to the occasion and be saints and other people will be sinners." Many things affect that, Moore says, but we may have to add parasites to the list.